Dust jackets offer a representation of a book’s content as well as an opportunity to provide an iconic and memorable marketing medium for a publisher. For books without illustrative matter the dust jacket is the only pictorial representation that will help create and focus the lens of the mind’s eye. Publishers and graphic designers work long and hard on the jacket design especially that most important aspect of the design: the front cover. 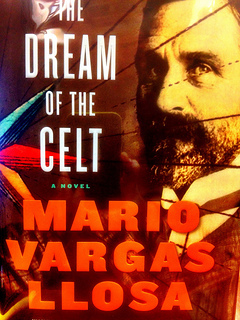 The newly published book, The Dream of the Celt by Nobel Prize in Literature winner Mario Vargas LLosa, recently reviewed in the Guardian, is a fictional account of the life of Irish Nationalist Sir Roger Casement who was hanged by the British government during the First World War. Several of Casement’s manuscripts are in Special Collections; as well, other materials which were collected by his friend and ally Joseph McGarrity are housed in the Joseph McGarrity Collection in Falvey Memorial Library. All of these materials have been digitized and are made available in Villanova’s Digital Library. Prominently featured on the front cover of the English language translation of the Dream, (translated by Edith Grossman, Farrar, Straus and Girous, 2012) is a photograph of Roger Casement drawn from the McGarrity Collection. 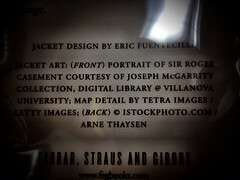 Credit is appropriately given for use of the photograph on the rear flap of the dust jacket by the designer Eric Fuentecilla.